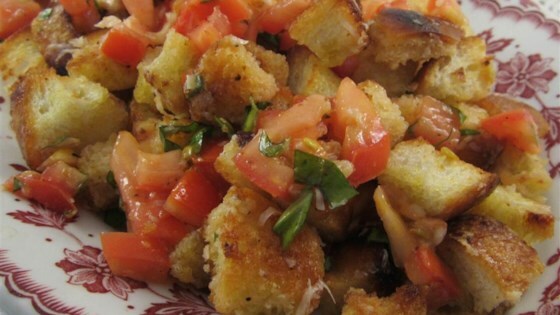 "The key to this panzanella is frying the bread cubes in loads of olive oil in a skillet, which obviously makes them crispy. But the healthful fat also soaks into the bread cubes and renders them semi-waterproof, or dressing-proof. The same goes for the dusting of Parmesan cheese applied halfway through the crisping process." Pour bread into a large skillet and drizzle with 1/4 cup olive oil, working in batches if necessary. Cook and stir bread over medium heat, adding more oil as needed, until bread cubes are golden and crispy on the outside, 7 to 12 minutes. Sprinkle Parmigiano-Reggiano over the top of the bread cubes; cook and stir until cheese is melted onto bread, and bread is crispy on the outside but still chewy on the inside, 3 to 4 minutes more. Cool completely. Combine tomatoes, red wine vinegar, extra virgin olive oil, garlic, sugar, salt, and black pepper together in a bowl until well-mixed. Cover bowl with plastic wrap and let sit at room temperature until flavors combine, about 20 minutes. Toss basil into tomato mixture; add bread cubes and stir. Let salad sit at room temperature 3 to 4 minutes; if the liquid is completely absorbed, add more vinegar and extra virgin olive oil to taste. Season with salt and black pepper. We loved it. I am not a big salad fan, but this was so tasty and easy. I even used store bought croutons. This will be a regular on our table. Thank you. Such a nice change from the usual summer pasta salads!